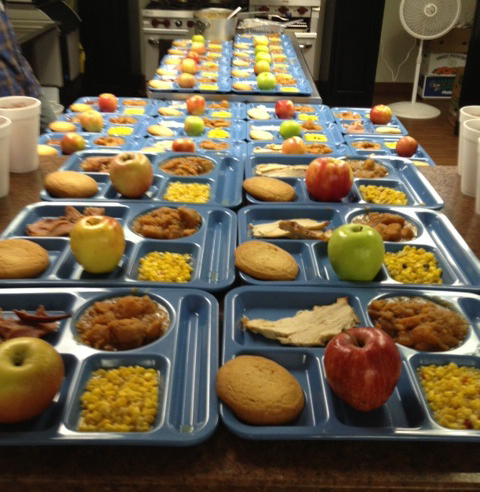 The Community Shelter feeds approximately 56,000 hot meals a year at our Soup Kitchen. We provide a nutritional breakfast, lunch, and supper to the community’s homeless and low-income residents, acting as a stop-gap for those without the ability to otherwise acquire food on a regular basis. We have no criteria for eating at the Soup Kitchen, so anyone with a food hardship is welcome – no questions asked. Our staff is ServSafe certified and we strive to maintain a healthy environment and serve a healthy menu. We are fortunate to have over 130 churches, civic groups, businesses, and other organizations who provide and serve our meals throughout the year, but we always need more. To book a meal, contact Onsite Operations Director Victoria Maye at (704) 261-3496 or at Victoria.Maye@UnionShelter.org. Our calendar of booked and available meals is at the bottom of this page. Breakfast is served at 8 a.m. Lunch is served at noon. Supper is served at 6 p.m. You may arrive as early as you need to prepare; however, we request you arrive approximately 30 minutes in advance to set up. The number of diners varies from 60 to 80, depending on weather and other intangibles. As your date gets closer, we will call you to confirm your serving date and time, plus let you know how many to prepare for. The kitchen is fully equipped; please contact Onsite Operations Director Victoria Maye at Victoria.Maye@UnionShelter.org or at (704) 261-3496 if you need to confirm specific equipment. Remember to bring all ingredients for your menu. Children are welcome to assist in the meal service; however, due to liability issues children 18 and under require adult supervision. The staff supervisor will call meal clients to receive their trays from the pass-through window. Second servings may be given after 20 minutes, once cleared with the shift supervisor. Your group should be approximately four to six people, due to the smallness of our kitchen. If your group is larger, we will have you serve the clients. Parking is limited so please carpool as much as possible. Health, hygiene and safe food service are very important to us all. These guidelines help to ensure that both you and our clients are safe. If a group member is sick, please have them stay home. Thorough hand washing is important. Wash hands after eating, blowing your nose, smoking, using the bathroom or after touching anything besides the food and tools you are working with. Head coverings (hats, bandanas, hairnets, etc.) must be worn in kitchen, (we furnish the hairnets). Food that will not be cooked further (bread after baking, sliced cheese, etc.) must be handled with disposable food service gloves or serving utensils.We provide gloves. Change gloves after touching anything other than the food you are preparing. You should clean food preparation surfaces with provided sanitizer before use, between preparation of different foods and during clean up. Raw meats should be kept separate from other items to prevent cross contamination. After raw meat is open on any surface, the surface should be thoroughly sanitized. Food at room temperature for three hours or more must be discarded. Anything washed in the sink or the dishwasher/sanitizer must be completely dry before being put away. Please contact Onsite Operation Director Victoria Maye at Victoria.Maye@unionshelter.org or at (704) 261-3496. The Community Shelter accepts food donations between 9 a.m. and 9 p.m. daily with the exception of meal hours (8 a.m., noon and 6 p.m.). Only properly handled and stored food will be accepted. Thank you for your service and commitment to the Community Shelter of Union County. Available meals are in green, booked meals are in pink. Each day has a slot for breakfast, lunch, and supper. You can scroll to future months by clicking the arrow button to the left of the month. Please email Victoria.Maye@unionshelter.org to book a meal. To sign up for our Meal Openings Email List, click here to enter your information. For a list of our highest need meals (weekends, suppers, holidays) to fill for the rest of the year, go to Meal Dates.